Local markets and shops in Tuscany and Umbria, here a list of the main and best. Supermarkets and main shops never open on Thursday evening and from 1.00 PM to 4.30 in fall winter and to 5.00 PM in summer and every Sunday. In the evening shops closed at 7.30 in fall winter and at 8.00 PM in Summer. Front of the supermarket there is a pharmacy opened every day but not on Sunday where to find and order special products. They speak little English. If you need a pharmacy on Sunday check the front door of pharmacy for stores that are opened. Also on Sunday and Wednesday morning there is fresh organic bread and breakfast at Lo Scoiattolo association in via Gramsci. Inside the village near the Bell Tower there is Peppicelli butcher shop (Macelleria in Italian), you can order there good meat for your barbecue! More butchers: Paciano butcher’s shop? Famila (if you are coming from Chiusi Chianciano) – located in Po Bandino area, it is open also on Sunday Morning. Monday – Chiusi (where to buy the best vegetables and a just done PORCHETTA (roast pork cooked in the bread oven) and Tavernelle (along the road to Perugia) and Gaiole in Chianti on the second Monday of the month; Radda in Chianti on the fourth Monday of the month. Tuesday – (2° week of the month) San Quirico d’Orcia – Every Tuesday in Chiusi high city. For big food shopping, also on Sunday Morning up to 1.00 PM – We like to go to COOP they have a good selection quality/price. Where: It is inside the shopping centre (also with pharmacy and more stores) called AGILLA (it is in bricks with a large parking area) in via de Nicola Enrico a CASTIGLIONE DEL LAGO. It is front of the TAMOIL petrol station. In the same building there are more shops like laundry. in via Novella 2, Castiglion Del Lago. We love all the patisserie, and don’t miss to order the full aperitivo! Just after Michele and co you will find another big Supermarket CONAD that is open also on Sunday Morning. 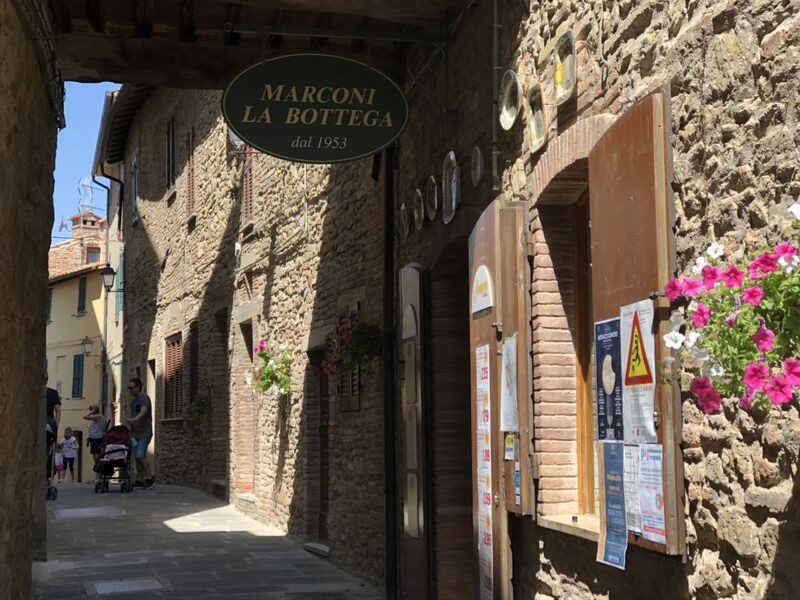 also on Sunday morning a close by supermarket is in Panicale at Locanda Marconi, 50 mt. after the delicious restaurant Masolino. 5) TO BUY FRESH PASTA, BEST OF UMBRIA GO TO MISS ADALGISA Pasta and pasticci. 6) FOR 100% LOCAL ORGANIC SHOPPING: LA SAPORITA, ORGANIC VEGETABLES, FRUITS AND MORE!!! not open FROM JUNE TO SEPTEMBER. Just outside Paciano (below bar Boldrini, follow directions to Perugia, and after 2 km on the left there is La Saporita cypress and pines entrance) 20 Vocabolo Collazzone, Mazzarelli, PG 06060 – TEL. 0039 075 830312.